Compressor Parts, Reconditioning Of Valves, OEM replacement spares for Ingersoll Rand Air Compressors, Deonar, Mumbai, India. Consistenet quality and efficient production are crucial for any manufacturer's healthy bottom line. Compressed air is a vital resources in PET blow molding operation. Inferior compressed air can lead to poor or unacceptable product quality. It is an advanced 100% oil-free reciprocoating compressor based air system. Totally engineered, Plant tested, Proven in perforance. Comes with optional built-in water/air cooling system. Needs no elaborate foundation. requires very little time and labor for installation. Ready to use. Just plug in to the power outlet and enjoy quality compressed air. Now you can say good-bye to.. Specifically designed and adapted exclusively for CP compressors, they ensure uninterrupted operation and long service life. As a result, you only need an annual shut-down for maintenance. Manufactuered on computerised SPMs, the perfect close tolerances and ensures an aerodynamic flow for low resistance. All of which means higher reliability, least valve losses & power savings. Shrunk fit bearings ensures proper alignment & clearance thereby reducing wear and tear. They have very high load bearing capacity. 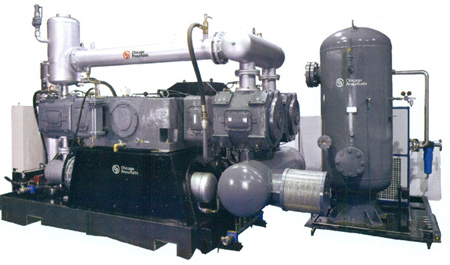 Ideally suited for short stroke & higher speed piston compressors. Very high reliability & hardly needs replacement. 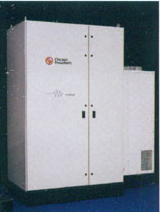 Result in lesser inertia forces resulting in increased power savings. Crossheads with wide guides to ensure perfect guiding. • Comprehensive monitoring through a PLC based interactive control panel which protects the Compressor with built-in warning & shutdown function. • It also helps to make maintenance management easier by giving prior indications of service requirements, and also to plan maintenance interventions in advance. • It also helps to assess the actual load on the compressor to optimize your compressor usage thus enabling you to decide the right size of compressor for your future expansion plans. Address: 21, 2nd Floor, Ujagar Industrial Estate,W.T.Patil Marg, Deonar, Mumbai - 400088, Maharashtra, India.